Sharknado capitalizes on the public’s want to not be taken seriously. We all want to be stupid. This isn’t new. Ignorance is bliss is why normal people like to identify with Forrest Gump and Raymond Babbitt. To throw away any reminder of adulthood and the pain we identify with growing up and replace it with a false sense of innocence has kept smart young people in the mesmerizing vampiric gaze of low-art for quite some time. Nothing can penetrate an educated youthful mind quite like a love for the dumb. It’s the last piece of childhood they have left. But why – oh god, why????? – must it be this dumb? This kind of entertainment is irony in reverse. Let us assume you’re in the target audience for Snakes on a Plane. Now, it’s possible you inhabit that demographic because you’re interested in how poisonous reptiles would react to high altitude. However, it’s more likely that you’re the kind of person who loves “bad” movies. You find poorly written films hilarious, and you enjoy their implausibility. Such sentiments are common; people who understand film tend to appreciate cinematic failure. But here’s the thing: This kind of appreciation is based on the premise that the bad movie aspired to be good. If a film never takes itself seriously and originates as satire, everything is different; its badness means something else entirely. SOAP doesn’t fit into either category: It doesn’t take itself seriously, but it’s not a satire. It will probably be unentertaining in a completely conventional way. Which, apparently, is what people want. They want to see Snakes on a Plane in order to tell their friends that it’s ridiculous, even though a) that’s the only thing everyone seems to know about this movie, and b) that’s been the driving force behind its marketing campaign. It’s not a bad movie that’s accidentally good, and it’s not a good movie that’s intentionally bad; it’s a disposable movie that people can pretend to like ironically, even though a) it’s not ironic and b) they probably won’t like it at all. The only purpose of Snakes on a Plane is to make its audience feel smarter than what it’s seeing. Which adds up, since that’s part of the reason people like reading the Internet. The last two sentences sum up the Sharknado experience for me. I am an amateur movie aficionado. Music is my forte, but film is my second love. I will take anybody on a one-on-one debate about rock music. Film? I might win, but there’s so many people that know more than me. I merely appreciate. However, what I do recognize in the art of movie making is that ironic sensibility that Klosterman was talking about. It’s usually confined to Ed Wood movies or whatever Sci-Fi was making before they became Syfy. Sharknado? There is no nuance to understand, no in-crowd to be a part of. You just have to not be Raymond Babbitt to get it. And that’s my problem: why are we slapping hands with each other for understanding things that are completely understandable? In Klosterman’s piece, he writes “What populism really means (at least when used outside politics) is that something’s significance is dependent not just on what it is but on the degree to which it represents the shared sensibilities of large groups of otherwise unconnected people.” The political ideal of sending the word “elite” into the bottom depths has now crossed over into the mainstream. We are #tcot with art: don’t tell us what is right, only the people will decide! Which is fine if you just want to have fun, not take things seriously and just ride life out. It’s not fine if you believe in grown modern humans continuing the practice of high art for the sake of evolution. The internet is stripping adulthood from the adults. We are acting like children. And children, may I remind you, didn’t write the lines for Raymond Babbitt. Adults who cared about art did. Not that there isn’t a place for silliness, but increasingly the internet is becoming a place of only silliness. Then consider the internet will be the only place coming generations will be having conversations. Yup, the real world will operate like Congress. Let’s see how that works out. July 31, 2014 in Entertainment, Rants. You completely, totally, miss the point. 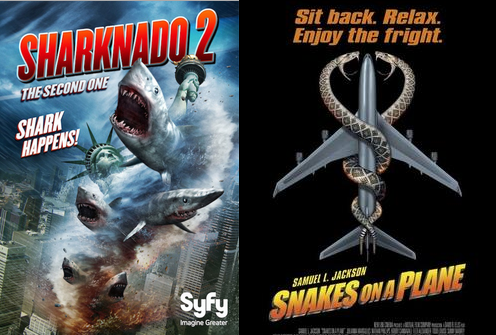 Sharknado 2, to those who found it entertaining, funny, and strange is all any of them wanted to begin with. Me included. I wanted some insane action, low-budget, bad acting, ton of cameos, and to laugh for two hours. My very professional work day and my responsible family night showcase my adulthood and maturity. Enjoying a movie for 2 hours doesn’t affect that at all. I love films, the art and the creation, as much as anyone. I also enjoy 2 hours laughing with my wife and friends, which is what Sharknado 2 did better than almost any movie I’ve seen in the last 4 years. I believe in grown modern humans continuing the practice of high art for the sake of evolution as much as you do. I also believe in having a good time, and subtly making fun of those who did with Sharknado 2 exposes more of your character than the film does about anyone who enjoyed it.